This article explains with the help of an animation video on how hydraulic ram or cylinder works. Let’s identify the components in this animation. We have a control valve, hydraulic pump, and the hydraulic ram or cylinder as shown. The hydraulic ram or cylinder connected towards the boom and the dipper of construction equipment as shown in the animation video. This part which you see in this animation is the excavator side of construction equipment. In the animation, the tutor is clearly showing the head side of the hydraulic cylinder. The head side is called so because it is the top side of the piston and has the maximum area of contact of the piston. The opposite side to the head side is the rod side. Here we have the piston rod. This is the rod side. What happens when the hydraulic pump is providing a flow through the control valve to the hydraulic ram or cylinder? When the hydraulic pump is providing a flow through the control valve results in the movement of the hydraulic ram or cylinder as shown in the animation. There are many ports in the control valve. The flow of the fluid is controlled by the movement of the spools in the control valve. When the ports are open, as we move the spool, you can see the ports get matched and obstructed. 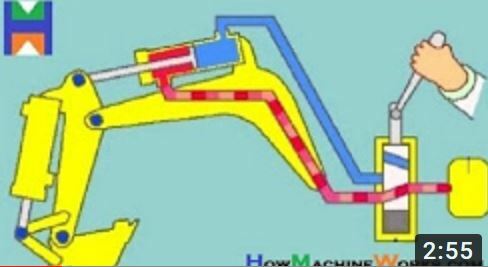 So what happens is that, as the machine operator turns the spool as shown in the animation. The hydraulic lines with the control valve matches. Initially as shown in the animation the ports or lines are not matching. However, when the spool moves, they match. When the ports or lines are not matching the flow comes, and it stops as shown in the video. However, as the spool moves the hydraulic lines match. The flow transfers through the hose and reaches the rod side of the hydraulic cylinder. This creates pressure and pushes the piston towards the right side. The oil on the head side returns towards the tank through the control valve. That’s the simple principle of how a hydraulic cylinder works and how the control valve controls it. The function of the hydraulic pump. The function of the hydraulic pump is to create flow. The pump is doing the function of a human heart. 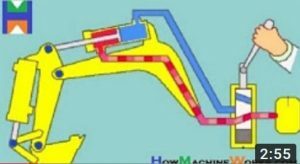 So the hydraulic pump is our heart, and its function is to supply the flow of the fluid to the different part of the hydraulic system. The hydraulic pump functions are similar to the human heart, which supplies the blood towards various organs. So the heart is working like a pump and a control valve too. Because the human heart has the function of pumping blood and also it has valves inside it. So it’s almost doing the same function of a control valve and a hydraulic pump in construction equipment. Hope this article with the animation video on how hydraulic ram or cylinder works was useful. Please feel free to post your doubts as comments, and we will respond to you. Previous Pumps and Motor – Introduction To Hydraulic Schematic Symbols. Next How do Submersible pumps work ?